The Ukrainian Institute of America, Inc. is a nonprofit organization dedicated to promoting the art, music and literature of Ukraine and the Ukrainian diaspora. It serves both as a center for the Ukrainian-American community and as America’s “Window on Ukraine,” hosting art exhibits, concerts, film screenings, poetry readings, literary evenings, children’s programs, lectures, symposia, and full educational programs, all open to the public. 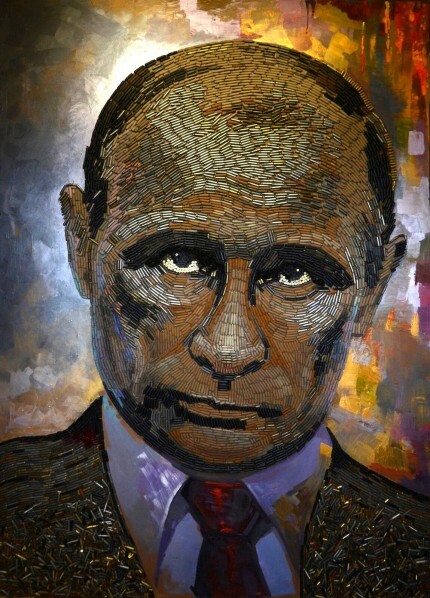 A seven-foot-high portrait of Vladimir Putin composed of thousands of spent bullet casings from the Eastern Ukraine war front was among the highlights of a large-scale multimedia exhibit at the Ukrainian Institute of America debuting last week. Coverage of the exhibit included CNN, Newsweek, Time Out New York, am New York, Untapped Cities, Secret NYC, and Metro New York.